South Orange NJ, March 21, 2019 – As Americans increasingly turn to online devices to follow news and sports, a Seton Hall Sports Poll conducted this week reveals that 38 percent of those who will be watching the NCAA Men’s basketball tournament will do so either entirely or partially online. The poll was asked of 606 adult Americans on both landlines and cellphones, with a margin of error of +/- 4.1%. Of the men’s tournament, 38 percent of all Americans said they would be watching at least part of the coverage. Split by gender, 49 percent of men said they would be watching the tournament, and 29 percent of women said they would be watching. Twenty-two percent of all respondents who will be watching also said they will watch the tournament while at work; among males that number rises to 29 percent. As for the Women’s Tournament, 24 percent of Americans said they would watch at least part of the coverage, with 29 percent of males saying they would, and 21 percent of females saying they would. On a question of whether the players are paid for participation (they are not), only 5% said that would make the tournament more interesting, 17 percent said it would be less interesting, and 76 percent said it would make no difference. 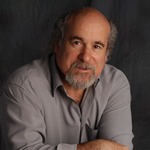 “Even with lawsuits emerging and the subject being more frequently addressed, there is surprisingly little difference in this result than when we asked the question four years ago,” noted Rick Gentile, director of the Seton Hall Sports Poll, which is conducted by the Sharkey Institute within the Stillman School of Business. (In 2015, 7 percent said more interested, 14 percent said less, and 79 percent said no difference). College Grads More Interested in Tournament? On a question of whether college graduates have more interest in the men’s tournament than those who did not graduate college, 50 percent of graduates said they would be watching the tournament, with 35 percent of those who did not graduate college saying they would be watching it. For the women’s tournament, 27 percent of college graduates and 23 percent of non-graduates said they would be watching. This poll was conducted by telephone March 18-20 among adults in the United States. The Seton Hall Sports Poll is conducted by the Sharkey Institute. Phone numbers were dialed from samples of both standard landline and cell phones. The error for subgroups may be higher. This poll release conforms to the Standards of Disclosure of the National Council on Public Polls. The Seton Hall Sports Poll has been conducted regularly since 2006. Do you plan to watch any part of the upcoming coverage of the NCAA Men’s Basketball Tournament? Will you watch any portion of the games while you are at work? Are you participating in any pools involving money for this year’s NCAA Tournament? If college players competing in the NCAA Tournament were paid a salary instead of receiving a scholarship would you be more interested in the event, less interested or would it make no difference? Do you plan to watch any part of the upcoming coverage of the NCAA Women’s Basketball Tournament? This entry was posted in Basketball, College, General News, Sport and tagged Advertising, Bracket Break, College Sports, March Madness, NCAA, NCAA Tournament, Online vieweing, Poll Results, Seton Hall Sports Poll, Sharkey Institute, Television, TV Ratings, Women in Sports on March 22, 2019 by Michael Ricciardelli. Two Years of College vs One? South Orange, NJ, March 23, 2017 — A clear majority of the American public believes that television revenue generated by the NCAA Basketball Tournament has turned collegiate athletics into too big a business, detracting from a university’s academic goals. Fifty-three percent (53%) responded “yes” to that question in a Seton Hall Sports Poll conducted this week among 739 adults across the country. Thirty-five percent (35%) responded “no.” The poll has a +/- 3.7% margin of error and is conducted with both landline and cellphone users. The poll is sponsored by The Sharkey Institute. When asked, however, how much importance universities place on graduating basketball players – 58% said they believed the schools placed either a high or medium importance on graduation. This is about even (59%) from a similar Seton Hall Sports Poll taken five years ago. Both the NBA Commissioner and the president of the NCAA have suggested raising the minimum age for eligibility in the NBA draft from 19 to 20. That essentially raises the commitment to college basketball from one year to two years. 19% thought it should remain at one year, but 41% favored two years. 26% said there should be no limits. When asked this question two years ago, 12% favored one year, and 56% two years with 23% saying no limits. 63% felt requiring an extra year of eligibility in college was a good thing, even if it meant losing a year of professional salary. 26% said no to the extra year requirement. When asked this question in 2014, 73% favored staying in school, a significant drop. 45% of the nation felt student/athletes should not share in TV revenue or receive a salary for participating, with 40% saying they are exploited by not sharing in the revenue and should receive compensation. Men are more likely than women to believe that the students are being exploited, and people 18-44 are much more likely to believe that the students are exploited than those over 45. 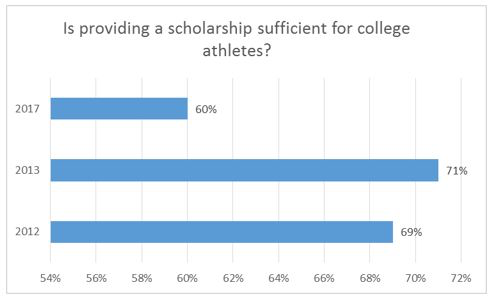 60% felt providing a scholarship was sufficient for athletes, whereas 69% (2012) and 71% (2013) in previous Seton Hall Sports Polls felt providing a scholarship was sufficient. 35% believe the athletes should receive some form of salary or salary/scholarship. On the matter of whether people fill out a set of brackets or participate in a poll over this year’s tournament, 13% said they did. 35% of the nation says they follow the tournament either closely or very closely. Interest in the tournament vs. the NBA playoffs is virtually even, with 30% saying they are more interested in the NCAA and 29% the NBA. But when asked the same question in 2014, 39% said the NCAA and only 22% said the NBA. In 2011, 44% said NCAA and 29% said NBA. 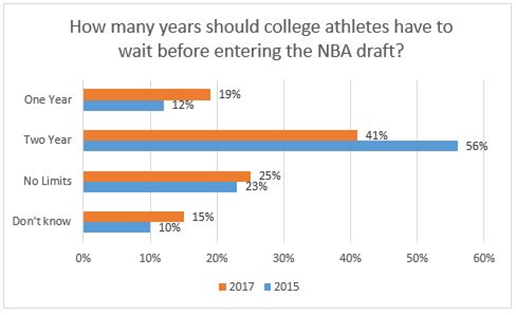 46% of respondents felt that most (or all) colleges break the rules in recruiting athletes, the same number as when the question was asked in 2013. Asked who makes better role models and given a choice of five options, 52% said teachers, 17% said coaches, 9% said college athletes, 9% said pro athletes, and 3% said politicians. This poll was conducted by telephone March 20-22 among 739 adults in the United States. The Seton Hall Sports Poll is conducted by the Sharkey Institute. The commissioner of the NBA and the president of the NCAA have suggested raising the minimum age for eligibility to the NBA draft from 19 to 20. In effect this means players would have to attend two years of college instead of one year as it is now. Do you think the rule should be left as it is now at one year, change to two years, or have no limits for when a player can be drafted? Do you think requiring another year of school for student/athletes is a good thing for them even though they could lose a year of pro salary? Do you think student/athletes who participate in revenue generating sports should receive a salary from their school, a salary plus scholarship or do you think a scholarship is enough compensation? not closely or not at all? Did you fill out a set of brackets or participate in a pool involving money for this year’s tournament? Do you think the selection process to participate in the tournament is fair to all division one schools or do you think schools from the major conferences have an advantage? Which event are you more interested in, the NCAA Tournament or the NBA playoffs or are you not interested in either? Do you think the television revenue generated by the NCAA Tournament has turned collegiate athletics into too big a business that detracts from a University’s academic goals? How much importance do you think universities place on graduating basketball players, a high importance, medium importance, little importance or no importance? How many college basketball programs do you think break the rules in recruiting athletes, all of them, most of them, very few of them or none of them? Do you think it hurts the game when colleges recruit athletes they know won’t stay for the full duration of their eligibility? Who do you think make better role models, college athletes, pro athletes, coaches, teachers or politicians? This entry was posted in Basketball, College, Podcast, Poll Results, Sport and tagged Brackets, College Athletes Exploited, College Sports, Gambling, March Madness, NBA, Pay for Student Athletes, Seton Hall Sports Poll, Sharkey Institute on March 24, 2017 by Michael Ricciardelli.